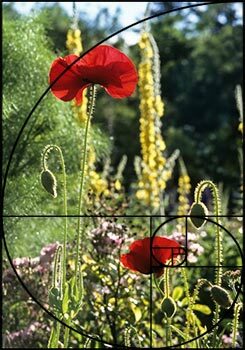 The Golden Ratio is a good intro to photo composition. If you're not a math whiz, no problem.... just a review of high school geometry. Nothing heavy, I promise. When I was in school, I didn't see much value in studying math and now I'm sorry I didn't pay more attention. Math didn't seem to apply to real life. But then I discovered a great TV show that changed my mind. Have you ever seen Num3ers? Absolutely fascinating. Charlie is a young mathematical professor and a genius. His brother's an FBI agent. Charlie solves crimes for the FBI with seriously complicated math. When he explains his theories in layman's English, I've got to admit that math might not be so irrelevant after all. And it's actually intriguing . Well, not long after Num3ers I learned about Fibonacci. 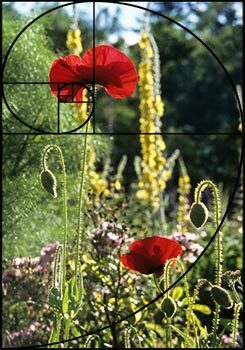 Fibronacci's "Golden Ratio" creates a spiral pattern that appears many places in the natural world. This sunflower right here, shows the spiral pattern clearly. It's easy to see that the tiny flowers and seeds don't just pop up in some random order. It's all a part of Mother Nature's amazing tapestry. You'll see the pattern in the shape of pineapples, pine cones, the branching in trees, fingerprints, DNA, the Nautilus shell, for a few examples. 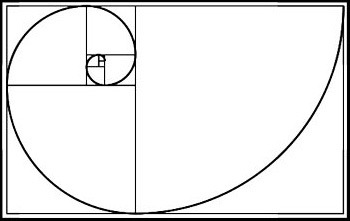 What is Fibonacci's Golden Ratio? Fibonacci published a mathematical sequence in 1202 in a book called the Liber Abaci. He wasn't the one who first stumbled on to the Golden Ratio - he came across it while he was studying East Indian mathematics. Before that, back in the 5th Century BC, Pythagoras seems to be the first one credited with discovering the divine proportion... Remember 1.6181 : 1 from school? 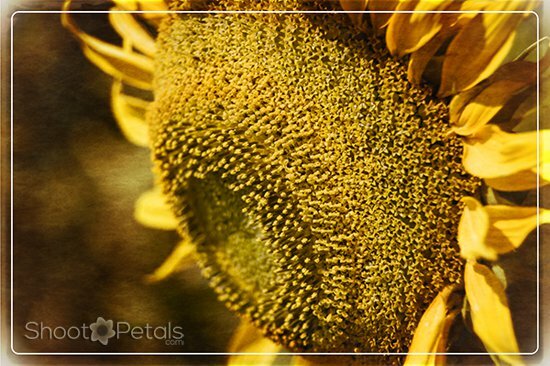 You only need the patterns that come from the golden ratio to make this work for your images. 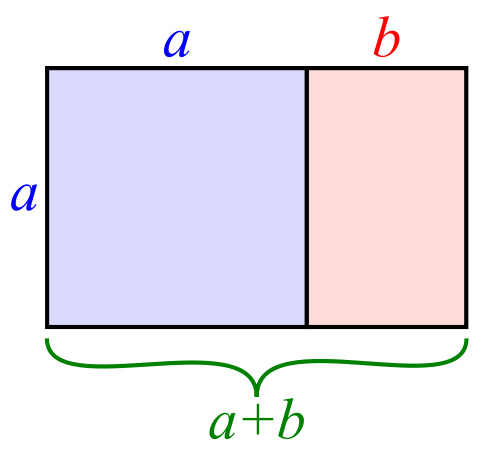 The rectangle is built of squares or "iblocks". The number of blocks that make up the sides of the squares are equal to the sum of the two numbers that come before them in the sequence. The first two squares that initiate the rectangle are the two 1's. Fibonacci iblocks transparency reprinted from Wikipedia Commons. The square next to them is two blocks each side, so next to 2 and 1 is a cube of 3 blocks (3x3). Still with me? You can just make out the the fern image I used under the iblocks transparency. This Golden Rectangle is one pattern worth using to design a picture.... and if you shoot the 2x3 ratio images (35 mm) it fits perfectly. The fern tip cozies right into the smaller iblocks rectangle. 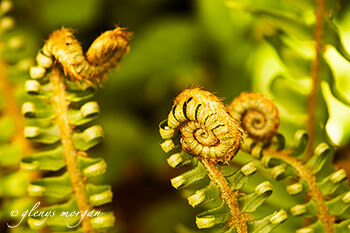 See how the V of the fern sits right where blocks 1 and 3 meet? The whole frond falls in the left-hand side of the image. I didn't say the left "third" because this large rectangle doesn't quite divide into thirds. Don't get the Golden Rectangle confused with the Rule of Thirds. That's a different photo composition topic and you'll find it here. The left side of this Golden Rectangle is a square and the right side is a smaller rectangle. Ever heard of "phi"... the magical ratio of 1.618? 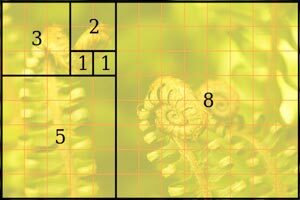 Here's how the Fibonacci spiral is created inside the golden rectangle. The spiral circles outward from the first iblock of 1... draw a quarter circle from the adjoining angle on the one side to the opposite side of the square. From there, continue drawing a circular arc to the opposite angle of the next square until all the squares are connected by this outward spiral. You just drew a Golden Spiral. Now imagine the Milky Way, spinning through eternity... the large picture looks pretty much like this! Fibonacci spiral reproduced from Wikipedia Commons. No matter which way you flip it, one of the two red poppies ends up at the beginning of the golden spiral. The partner poppy hangs along the curve at the opposite side. I took this 35 mm slide my second year studying photography. It's one of my best. The exposure and focus are perfect but what tops it off is the composition. Took me awhile to figure out why it felt "right on"! These poppies were blooming in the perennial garden at VanDusen Botanical Garden in Vancouver. Now that I've added the golden spiral and triangles to this tulip photo, help me evaluate the composition. 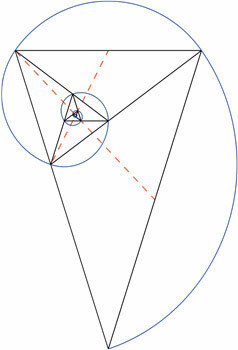 Fibonacci spiral and golden triangles reproduced from Wikipedia Commons. The dark foliage sits along the outside of the spiral. That was a bit of luck... I set the trees up as a "frame" with some space between the dark foliage and the tulips and it worked out well. A little extra about the three tulips at the bottom... 3 is a magic number whenever you make a grouping. Even numbers seem off-balance and just don't work well. Groups of odd numbers are the best and 3 feels most comfortable. When I evaluate my photos, even though the focus and exposure is right on, sometimes one just doesn't click with me. There doesn't seem to be anything really wrong with it. ... but this tulip image felt comfortable to me. 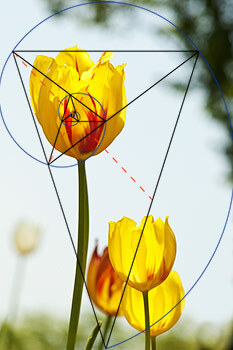 Look where the 4 tulips fall within the golden spiral. They're all inside and the closest one is alone, right where the spiral begins! See?... it also fits inside the mid-sized golden triangle. The long side of the largest golden triangle bisects the group of three tulips and they're snug inside the spiral and the other side of the largest triangle. By the way, I didn't have a conscious checklist on my mind when I took this photo! Once you understand the concepts, they sink into your brain and eventually, your design comes automatically. The golden ratio is just a beginning, but it's a good start if you want to improve how you compose your shots. When you feel like something isn't quite right but can't pin-point why, check your composition for starters. Also, use other photographers' images for comparison. Keep a file of images that you really connect with. How does the image make you feel? What kind of light, composition, exposure did the photographer use? So here's your homework...give some thought to Fibonacci and the golden ratio - the rectangle, spiral and triangles. Go out and compose your shots so they fall into these designs. Or find a subject that expresses the golden ratio in its natural pattern. If it's cold weather where you are now, buy a few sunflowers at the flower shop and set up some still life photos. Take out your macro if you can get some miniature sunflowers. Read this article to get some ideas. If you're interested in Fibonacci and understanding more about the golden ratio, there are scads of resources on these fascinating numbers. Get a general grasp of the spiral, the iblocks, the triangles... use them to improve your image composition.